Facts about the Yukon: The Yukon River is the longest river in Yukon & Alaska. Third longest river in North America, flowing northwest from the Coastal Range mountains of northern British Columbia, through the Yukon Territory and Alaska to the Bering Sea. The Yukon River is the longest river in Yukon & Alaska. Third longest river in North America, flowing northwest from the Coastal Range mountains of northern British Columbia, through the Yukon Territory and Alaska to the Bering Sea. Its overall length is 3,185 kilometers (km), with 1,149 km within Canadian borders. The watershed’s total drainage area is 840,000 sq. km (323,800 sq. km in Canada) and it discharges 195 cubic kilometers of water per year. During the Klondike Gold Rush the Yukon River was one of the principal means of transportation. Paddle-wheel riverboats continued to ply the river until the 1950’s, when the Klondike Highway was completed. Yukon’s dry, continental climate results in a wide variety of weather year-round. Humidity is very low, so summers can be hot and dry while winter coldness is less harsh than in damper climates. 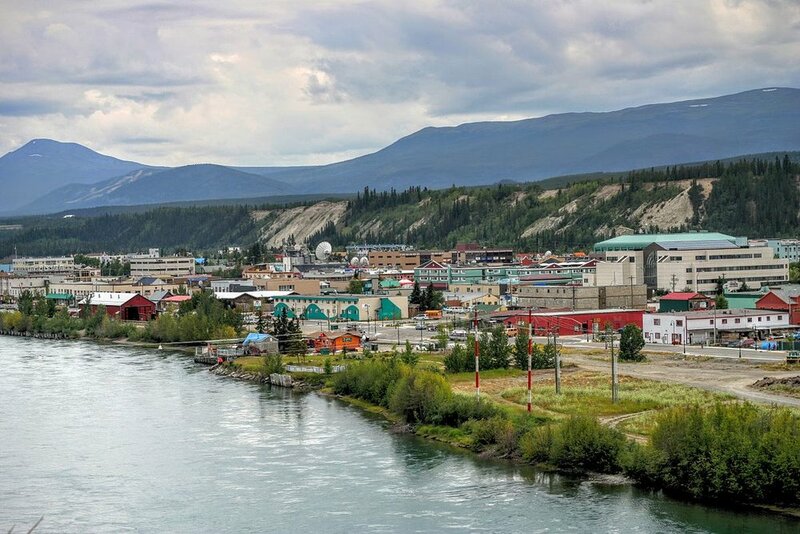 Whitehorse is Yukon’s capital and a major northern hub. It enjoys facilities, services and businesses far beyond the expectation of a city of 30,000. It's a big little city surrounded by wilderness with the amenities of a much larger destination paired with the friendly demeanour of a close-knit community. Yukon weather has been known to be quite variable as an Arctic air mass can dominate one day, and the next day a warm front can move in from the Pacific. On your expedition you could experience all four seasons in one day! With varied geography and changeable weather, it's important to be prepared for sudden changes in weather and temperature, especially since we are on a canoe expedition. In summer, the temperature can be plus 30 Celsius and the blazing sun shines around the clock. Above the Arctic Circle, the sun doesn't set on June 21st and it doesn't rise on December 21st. When you visit Yukon, chances are you'll discover the relaxed dress known as 'Yukon formal'. Whatever the season, pack a wide variety of clothing. Layering is always a good idea so you can adapt to changing weather and temperatures. To view our Yukon packing list, click below. Summer is June to August. The sun barely sets. People are full of energy. Days can be hot, and the evenings cool off.